The trouble with books about the Big Issues is that they often descend very quickly into lecturing and moralising, especially when they’re aimed at a youth market. 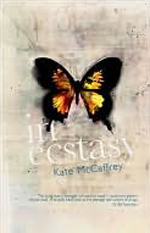 With In Ecstasy, Kate McCaffrey does a great job of avoiding that route and thus ensures that her novel will be enjoyed by the young readers it’s aimed at as well as the adults who judged it winner of the Australian Family Therapists’ Book Award in 2009. As a book about the dangers of drug use, In Ecstasy pulls few punches and represents the world of addiction in a way that bears many similarities to the personal accounts of those whom I’ve spoken to about their own experiences of heavy drug use as a teenager. Because of its realism, this is a darker book than many people would be comfortable reading. Sexual assault occurs more than once and, while the description is not graphic, the incidences are dealt with in such a manner that they could still prove very triggering to some readers. The novel is presented from the perspective of two best friends, Sophie and Mia, with alternating first person chapters that employ two different fonts in the edition I read. At first, it’s easier to identify with Mia, because Sophie seems so perfect and self assured, but as the book progresses, the reader learns that Sophie has her troubles and her faults as well. At the same time, Mia becomes increasingly consumed by her drug use, which can’t help but erode some of the sympathy she had formerly gained. As the drugs take over, her behaviour becomes more and more selfish and she herself becomes less and less likeable, which I think is actually one of the strongest aspects of the novel. McCaffrey shows how drugs turn an average teenage girl, whom young readers will easily identify with, into someone who steals and deeply hurts her family and friends. Most of all, however, Mia hurts herself and it is her self-loathing and self-destruction that are especially painful to read about. In Ecstasy is a strong novel with an obvious message that doesn’t overwhelm the story it tells. Due to the dark nature of much of its content, I would recommend it to older readers.